Food Adulteration is the major issue in India happening today due to the rise in population. Do you know that India produces 68 percent of adulterated milk? To overcome this issue, a team from IIT-H (Indian Institute of Technology – Hyderabad) developed a sensor system which detects the quality of the milk through Smart-Phone. The sensor system which is developed by this team detects the adulteration of milk with a maximum accuracy of 99.71 percent. Coming to team introduction, this team is led by Professor Shiv Govind Singh of EE (Electrical Engineering) Department, IIT-H. This team consists of other assistant professors from the department namely Siva Rama Krishna and Soumya Jana Below is the picture of the team. There are many techniques like Spectroscopy and Chromatography which are used to detect the adulteration. These techniques include costly equipment and cannot be easily carried from one place to another and these cannot be made under a limited budget. 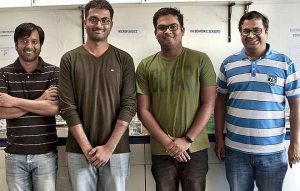 Therefore this team developed a smartphone-based sensor system to detect the adulteration of milk which is made at very low cost and can be used by consumers easily. Initially, this team developed a sensor system that is used to detect or measure the pH value of the milk (i.e., which indicates the acidic nature of the milk). To develop this system the team used a special process called “Electro Spinning” that produces a material similar to the paper which is made of nano-sized nylon fibers. This material consists of a mixture of three different dyes which changes its color based on the acidity level of the milk. Once after the first test of this sensor system, the accuracy level was 99 percent. This team also developed an algorithm for smart-phone. Based on this algorithm, when the sensor with strips is dipped in the milk the adulteration of milk is captured by the camera of smart-phone. Finally, the color changes are transformed into pH level data and displayed on the screen. After this, they have tested different contaminated levels of milk and met the accuracy level of 99.71 percent. The team is looking forward to developing small devices for this process which are budget friendly.